Researchers will engage new migrant populations and planners in Bangladesh’s second city to build human security into planning processes. 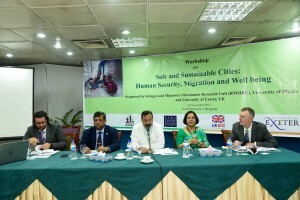 The launch of a new project in Chittagong has brought together environmental and migration researchers from the University of Exeter and the University of Dhaka to undertake research on implementing safe, resilient and inclusive cities for sustainability. The project is funded by the Economic and Social Research Council and the Department for International Development in their scheme for frontier research on poverty alleviation. The project is testing the idea that integrating new migrant populations into planning is key to sustainable urban development, particularly for rapidly growing cities in Asia and Africa. The research focuses on Chittagong, a city that has grown from 1.5 million people at independence in 1971 to 5.1 million people today. The research will involve surveying migrant populations about their human security, wellbeing and priorities. It also uses photography, allowing migrants and city planners to explore their own meanings of safe and sustainable cities. The research seeks to build empathy between planners and new migrant populations towards shared visions of the future. Professor Neil Adger, from the University of Exeter, said: “This is a first test of the idea that new migrants are critical in planning and building new cities. “If new populations are invisible, the cities will not work for them, nor they for the shared vision of the city. “We will explore whether visualising sustainability through photographs helps professionals and lay citizens to take each other’s perspectives in their joint visions of sustainability. Professor Tasneem Siddiqui, founding Director of the Refugee and Migratory Movements Research Unit, said: “Chittagong is a special place; it is a thriving commercial city of Bangladesh but faces critical development challenges. “Migrants come here as their land is being inundated on the coast. “Ethnic minorities from the Chittagong Hill Tracts are being squeezed from their land. The project will partner with the city’s Export Processing Zone, Chittagong District and Divisional office, Port Authority, Chittagong Development Authority, and most importantly the City Corporation of Chittagong: the Mayor and his professional planners will participate in the photographic research. The project was launched in the city this week. ‘Safe and Sustainable Cities: Human Security, Migration and Well-being’ Is led by Professor Adger, Dr Ricardo Safra de Capmos and Professor Tasneem Siddiqui (University of Dhaka) and funded by the UK ESRC and DFID.